​​I just received my Hay Pillow, and all I can say is "wow"!! This is exactly what I have been looking for. I have tried several other slow feeders, and this by far is the best. I am able to feed her in her hay net, and also use the pillow. It allows her to eat all day and all night without over feeding. I weigh her daily rations and am feeding the same amounts, it just simply lasts longer. I don't have to worry about her getting injured, and am not stressed out that she has to go for hours without eating while I am at work. Priceless.. Nothing slowed her down like this does, yet she doesn't seem frustrated at all. She moves around while eating, head is down, and she seems more content. I could not be happier. Probably going to order more so I always have one. Thanks for a great product. I love these pillows and as you can see from the photo, they have multiple uses. These saved my horse during a long period of stall rest and are her preferred source for eating hay. We love the hay pillows. Just wanted to send a quick thank you for my newest order of Hay Pillows. Love them as always especially the new zippers (string). Still amazes me that my girls pick them over their old hay nets that are technically easier to get hay out of. LOVE that they are always moving and that they have access to hay 24/7 it really helps! Both are VERY easy keepers with one being a nervous eater (was at the bottom of old herd's pecking order) so this takes away her stress as well as having them eat as they choose without actually consuming more hay. I LOVE the hay pillow I just got. My pony is short but is at a facility built for gigantic WBs so hanging a net for her would have been awkwardly high and I didn't like the idea of stressing her neck but she has been getting a bit porky as of late. The ground feature of the hay pillow was the perfect solution and has slowed her hay intake significantly! I am happy because she is losing weight but also always has something to munch on to keep any stomach acid issues at bay. The perfect solution! Love it! I ordered 3 regular size Hay Pillows for my 3 horses, who live out 24/7 in a small dry pasture with free choice hay in slow feeders. They have access to a variety of hay nets and feeders, but immediately they were drawn to the Hay Pillows. They seem to enjoy eating from the Hay Pillows most of all, and have consistently eaten them empty every single day! The Pillows are very easy to use, simple to fill and cart around, and I'm amazed at how well the sturdy zipper works even with hay everywhere. They are a huge hit with my gang! What I love most about the hay pillows is how rugged they are. I am using them to feed two Gypsy Vanners, one of whom is 7 months old. They stand on the hay pillows when eating and they pick up the pillows and toss them around. I've found the hay pillows hanging on top of fence posts from exuberant tossing. So far, my girls haven't managed to do any damage to the pillows. I'm very impressed! THANK YOU so much for your advice and care! Freckles is one of almost 200 rescued equine who call Duchess Sanctuary home. We love her hay pillow because it keeps her from spreading hay over half an acre of paddock, and prolongs her meal time. Just got the hay pillow today and the very first thing I noticed is that my mare, the voracious eater, is only getting single to double strands of hay at a time!! With every other slow feeder I have tried, she has pulled large amounts of hay out at a time and can empty the previous bag that I have tried, which holds at least two big flakes in about 30 minutes!! So after watching her for about 10 minutes... she can't find the opening at the top, where previously she could always steal extra hay from and she can't pull up a giant mouthful from the square openings. YAY!! And on top of all of that, it was SO EASY to fill!!! I am a very happy camper at this moment!! My Canadian mare loves her hay pillow - it makes lunch last so much longer! I love that it slows her down, keeping her eating for many more hours. ​Hi, just letting you know Whisper loves her hay pillow. She eats from it so easily and calmly compared to her attacks on her ****** ***. It is a superior product. I am filling it two or three times a day and not leaving in the stall overnight. I would say she is a calmer less anxious horse due to improved feeding slowed by the hay pillow. Malibu & her goat, April love to share their Hay Pillow. Just wanted to let you guys know we love your product. I always was interested but never came around to order it until my beautiful Standardbred mare Bella had Colic surgery a month ago. So I needed something to restrict her eating in a more natural way possible. Thank you. Finally something that slows this girl down. I’ve tried everything and finally now Tala has to slow down eating her hay. Not the greatest picture, but these 2 love their Hay Pillows!! I have had the same pillows for over 3 years, and they hold up great, even through snowy New Hampshire winters. We finally found the Hay Pillow! The vet recommended this The Hay Pillow, Inc. as an alternative to hanging nets. This thing is awesome! We got the recommended 1 3/4 holes to start with...to reduce frustration. Luna eats VERY fast....and she is a very easy keeper...so this is going to keep her busy. Yay! It's been a few weeks now with our new Hay Pillows and I wanted to tell you thanks and send along some pics. My two Miniatures, Bon-Bon and Cash have adjusted quickly to the system and using the hay pillow. The Mini Hay Pillows are indeed everything you said they were and more. First, when I opened the package which you promptly shipped Express, I was pleased with the rugged quality, and that they looked like they would survive my two hungry monsters tearing into them! Initially, I'll admit the horses were a little annoyed at having to work a little for their food, but in a matter of a day or two, they readily pulled the hay through the 1 and 1/4" squares without having to be "started" by me. At that point I didn't leave any extra hay in the stall other than what was in the bag. The first few feedings I did however put a handful of loose hay on top of the hay pillow, so they'd eat that first, take the hunger edge off, and then be ready to graze for their dinner. 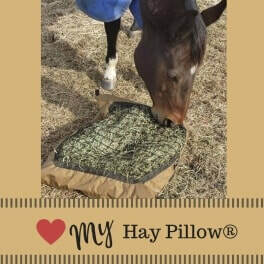 So easy to load, the Hay Pillow keeps the stall much cleaner, and keeps the horses nibbling and grazing on and off all day long. So happy to have found your product. You were a pleasure to speak with that day I called with questions. I was so surprised how quickly you responded to the message I left on the answering machine. I so appreciate that these days when return phone calls go ignored more often than not! You are a genius, and I'm passing this info to all my friends here and on my Facebook page. Yours is a product that is a MUST for all horses, Miniature or not! Thank you for making such quality products! Our little mini is a chronic colic and founder case. We have struggled tremendously to keep her healthy. We have implemented a "track" style to our paddock, very little to no grass and 4 Hay Pillow products placed on each side of the paddock. The two of them move each other between the hay pillows all day, encouraging and aiding digestion and increasing circulation to the all-important hooves. We've tried several other more expensive products, but yours work the best! Mobile Minis absolutely loves your hay pillows! Finally after years of trying other products, this one is the best. It is lightweight, durable, easy to fill, no spills and our minis love them too! Thank you for making such an awesome product! I thought you would like to know that the hay pillow went over huge. I think 2 or 3 other owners are going to purchase one. Sparkles (37.5” miniature horse) has gone from inhaling her flake of hay in very short time to only getting one third thru it in two hours. She is calm and not frustrated. It really slowed her down and it is always emptied so she is eating it all. And no mess or waste. I love it. I love my mini hay pillow. I use it in the round corral which my two mini mules take turns using, it really helps make hay last longer. And with the addition of a nice smooth rock, didn't "leave" overnight with our heavy (20-60/hr) winds. Thanks for your compliments about my being willing to try something new!!! I think I would have to say I am completely amazed and so happy with the differences in my little horses. I am beginning to get into a routine now. The night before last I gave Peanut and Sierra the choice of leaving the barn if they wanted to. I think both of them stayed out most of the night. Last night I let Little Juan have that choice, too. This a.m. Little Juan and Sierra were standing next to each other in the morning sun! I feel like all the horses are more sociable, calmer, and more together as a herd. Little Juan seems more alert and feisty... like I’ve actually seen him push Peanut away from his hay pillow! I’m definitely loving these hay pillows for my minis! Today I had a student and her mom. First student since the pillows. The mom mentioned Sierra seems different... much friendlier! I think all of them are more relaxed. My three mini-donkey Jennets LOVE their Hay Pillows. I love the savings from reduced hay loss, easier to clean stall floors, reduced aggression since each has their own pillow and their attention is focused on it ... not each other. Just an update, both my girls (ponies) ate using your Hay pillows with absolute success! I cannot thank you enough for your outstanding customer service! Love the quality and am very thankful for your ingenuity. We are loving our Mini Hay Pillow here in New Zealand. It’s become an enrichment for them too, they get really stuck into the task of getting the hay out! It was also great in a recent storm keeping the hay out of the mud allowing them to eat something nice through the awful weather. Thanks so much for your great product! ​As predicted Stanley, my left brain mini took it as a challenge for him to work out - loved it!! You could really see him thinking about it and he's taken to it beautifully. Teddy, my right brain Shetland wandered off and pretended he wasn't interested. I crouched down beside him though and showed him how to get the hay out and now he also is happily eating away from the Hay pillow. The pillows are brilliant - just the thing for these two to keep them eating and busy without consuming a huge heap of hay- thank you !!! Hey Monique, Just wanted to let you know how thrilled I am with the Mini hay pillows we purchased! All three of my minis love them. I let them have it only at night...and their eyes really light up when it's "Pillow Time". The fact that my older mare who is "all about the food" chooses to pick on the hay in her pillow when I put a loose pile of hay right next to it astonishes me. I think they like the challenge...it helps them not be bored . The color of the pillow is perfect since they do get a bit dirty...and the color you chose really hides the dirt. Also, they are really well made. Congrats on a fabulous product! I ordered 2 Mini Hay Pillows - one for my mini and one for my donkey. The horse took to it IMMEDIATELY - the donkey took a few hours before she would eat from it. Now they have hay 24/7, they eat slowly and no hay ends up on the floor of their stalls. Monique was wonderful to deal with- she knows her product inside & out. The hay pillows are so tough I doubt my "children" will ever destroy them. They are super easy to fill and have a ZIPPER to close the bag. If you have an equine who eats from a hay bag you have got to try a HAY PILLOW. I love the hanging hay pillow (standard size mesh). It's such a great product and my horse loves the one I have, but the second horse would like one of her own, too. She's had to use the cheap crappy version. By the way, I used your hay pillow when I went on a ride in the Kansas Flint Hills with the Kansas Horse Council folks. I told everyone your website address, so I hope you get some orders. Perfect pillows for my baby! The hanging hay pillow I put in Rosie’s stall and use it in the horse trailer. It’s a great size. She also has a Standard Hay Pillow in her paddock. She loves to walk back and forth eating little bits at a time going inside and outside. I’m ordering another so she can have 3 locations to eat from. She loves walking and eating, walking and eating. Never really thought about it but it is what they do when they graze! Incredible product, thanks so much. ​I love this bag for my goats. They now have hay available 24/7. I no longer have to spend time cleaning up wasted trampled hay or go out to feed early in the morning. The Hanging Hay Pillow has made a huge difference in how less anxious she is now that she has available hay at all times. Its wonderful! Also, I believe I mentioned in an earlier email that I had ordered one of your Manger Pillows, but in case I didn’t, I will say I just love traveling with it. All the hay stays in place and I don’t have to worry about her trying to reach it on the floor while we are moving. Manger Hay Pillow is a great bag for hauling. My horses were so frustrated, the hay always ended up on the horse trailer floor and they couldn’t eat it! Easy to load and strap into the mangers. They are happy campers and love their Hay Pillows. Thank you for designing a bag to accommodate such a unique application. As an endurance rider, getting my horses to eat as much hay as possible is a top priority, and I typically travel several hours to get to events. Previously, I would place hay in the mangers of my slant-load trailer and would be exasperated when I arrived: the majority of the hay was always on the floor. My horses were frustrated because they were hungry and couldn’t get to the hay even though they could see it. 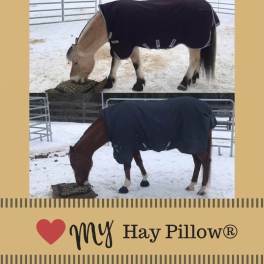 Since I started using the Manger Hay Pillow, I have found that my horses will typically eat about 1-3 pounds of hay when traveling a few hours. Almost no hay is on the floor, and the uneaten hay is compactly restrained in the pillow. Further, I don’t worry about hay getting in their eyes because the hay stays in the hay pillow. My younger mare in particular is a chow hound, and she arrives much more relaxed because she’s been eating. She’s also the one that finds a way to destroy the indestructible, and my Manger Hay Pillows are completely intact after several months. I also like to use the hay pillow as a hay bag. With a bucket strap, it connects to the outside trailer hook very quickly so that my 16+ hand mares have plenty to eat. I’ve been using the Manger Hay Pillow for a few months now and consider it to be a staple item. This is a much-needed accessory for anyone that transports horses in a slant-load trailer with mangers. Thank you for designing the Version II bags. I ordered one bag and 3 net panels. I was able to determine which mesh size worked best for each of my three horses and then ordered more bags and panels. The netting panels were super easy to install and swap out. My herd is content eating and living together for the first time ever! They have 5 bags available at all times and moving so much more. Life has changed drastically for me and my herd. Fantastic product. Love these Version II bags. Ordered one bag and netting panel, the mesh size was too large so I ordered my second panel and it is just right. Thank you for providing an inexpensive way to experiment with mesh sizes. My horse loves them as I have one hay pillow in his stall and one in his paddock so he can decide if he wants to eat inside or outside. Surprisingly, even when it’s cold and windy, he prefers to eat outdoors. He used to paw at the stall door and whinny when I got to the barn to feed, now he just looks up from his Hay Pillow and keeps eating. Bravo! The bale nets were a perfect solution for all the wasted hay. Thank you for suggesting them. I didn’t think it was an option since they are all shod. Clipping it in a tub worked perfect. I put out all 3 and they are happy and moving all the time. My husband thanks you too; our feed bill is less. I’d like to provide some feedback. So happy that my horses took to the nets immediately this morning. They figured out what to do and tried all 3 options. I was thrilled to find a small amount of hay left at the end of the day, lasted so much longer than meal feeding. My life is so much easier. I am not feeding 5 times a day. Thank you for the bale nets and my freedom. Thumbs up for the small bale net. My horse is a 2,000 lb. draft horse and eats allot of hay! I hang the net in his stall, no waste and I don’t have to worry about him running out. He is so content; he doesn’t even whinny when I come in the barn and is so much more relaxed. Thank you for a great solution.